and approved by the GLWSC Board, December 10, 2018. 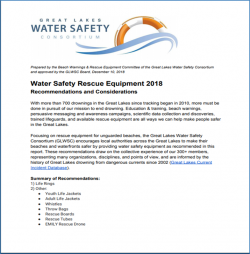 A multi-year effort, the GLWSC experts reached consensus and developed recommendations on the best equipment for shoreline communities looking for better ways to help keep their visitors safer and avoid a tragedy. Topping the list are life rings. An orange 20″ life ring with an attached line is a well-known symbol – it can be tossed, dropped, or dragged to someone in distress, and can be mounted on a metal post with a warning sign. Other recommendations include loaner life jackets, rescue boards, throw bags, whistles, and unmanned drones. The Great Lakes Water Safety Consortium is a non-profit organization led by Jamie Racklyeft, Communication Director for the Michigan Institute for Clinical & Health Research (MICHR), with more than 400 members from dozens of organizations in the eight Great Lakes states and Ontario. With a mission to END drowning in the Great Lakes, this “community of BEST practice” focuses on messaging, beach warnings, rescue equipment, lifeguard advocacy, and more. If you have questions or would like to join or support the GLWSC, visit their website at www.GreatLakesWaterSafety.org or contact Jamie at jracklye@umich.edu.